Towards the end of the nineteenth century the Catholic Church was facing an unprecedented social crisis, the immiseration of the working classes of Europe. In the words of the encyclical Rerum Novarum (1891), 'The misery and wretchedness pressing so unjustly on the majority of the working class' cries out for amelioration. In the face of this the Church could not be silent, even if it meant going beyond its normal comfort zone to speak of these 'new things'. The response of Pope Leo XIII set the agenda for Catholic engagement with and participation in the emerging labour unions of the day. To this day it remains a document honoured within the union movement. It was a bold experiment in Catholic social teaching, an experiment we are about to see repeated by Pope Francis with his proposed encyclical on the environment, due to be released in June. While both John Paul II and Benedict XVI made passing reference to environmental issues in various documents – Benedict’s encyclical Caritas in Veritate spoke of the need for protection 'the environment, of resources and of the climate' – Francis will be offering an entire encyclical on environmental issue, with a particular focus on climate change. In terms of its significance, this encyclical has the potential to do for the environmental movement what Rerum Novarum did for the union movement, provide it with a powerful source of moral and religious legitimacy in the face of those forces which have sought to limit their influence. 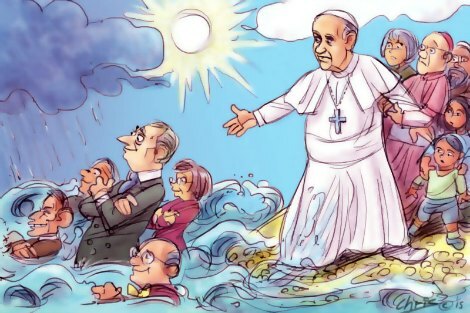 The fact that all this is occurring some months before the encyclical is scheduled to appear is unprecedented, and a strong signal of the powerful vested interests seeking to silence or at least mute the Pope’s expected stance on climate change. The day after the Heartland meeting, the Pontifical Academies of Sciences and Social Sciences held their own seminar and invited the General Secretary of the United Nations, Ban Ki-Moon, to speak. Ban praised the moral leadership being demonstrated by Pope Francis, hoping that this leadership will prove influential in the upcoming Paris climate talks in November this year. The battle lines are being well and truly drawn. To all intents and purposes the encyclical is a finished document, going through the process of translation into various languages. I’ve heard said it is a lengthy document, perhaps the longest encyclical yet. But like its famous predecessor Rerum Novarum, the focus of the encyclical, like so many of the Pope’s concerns, is the impact upon the poor. 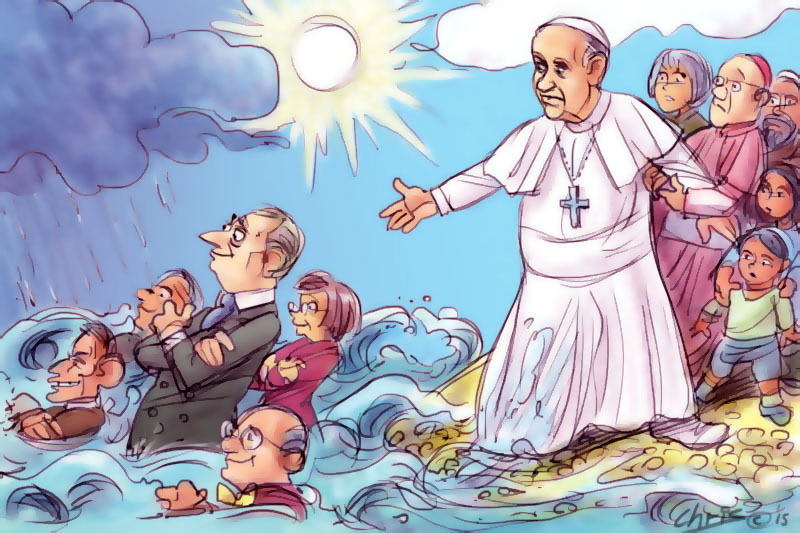 The long awaited encyclical will be a landmark in Catholic social teaching. Neil Ormerod is Professor of Theology at Australian Catholic University, a member of ACU's Institute for Religion and Critical Inquiry and a Fellow of the Australian Catholic Theological Association. I caught Dr O’s reference to the “serial eccentric” Lord Monckton. Why the epithet? Perhaps because, when he’s not engaged in the debate about climate change, Lord Monckton is writing pornographic novels, and sexually harassing his female colleagues to the extent that he’s been charged, and has had to withdraw from public positions as a result. Except… er, that’s not Lord Monckton, but the warmist, very recent former head of the IPCC (the supposed supreme world magisterium on climate change): the never-billed-as-“eccentric” Dr Rajendra Pachauri. Crickets from Eureka Street bloggers on that! But, horror of horrors, Lord Monckton disagrees with the lefties’ darling Pope Francis the Great on non-infallible issues. Such as whether the earth is catastrophically over-heating due to recent human activity, given that since about 1980 the atmosphere warmed unremarkably for about 18 years, and from then, with significantly higher levels of CO2, has stubbornly refused to warm at all. He’s also an accomplished mathematician, and someone no warmist has had the guts to debate publicly for many years now (there’s your chance, Dr O: low-hanging fruit, surely?) Worse: he’s also a traditional Catholic, and unashamedly pro-life. To top it off, he has goggly eyes due to a medical condition – a physical disability that leftists are able to ruthlessly exploit via photos, notwithstanding their vaunted concern for “people with disabilities”. So, clearly, fair game. Ah, HH, if I had not put in the epithet you would had to have complained about something else. In relation to Lord Monckton: He is not an “accomplished mathematician”. He has a degree of classics and once created a mathematical puzzle. As far as I can tell he has published no research papers in maths, has no qualifications in maths, and is at most an amateur. I have a PhD in maths. I would not consider myself an “accomplished mathematician”. Monckton is a director of Resurrexi Pharmaceutical which claims to have produced cures for multiple sclerosis, influenza, and herpes, as well as reducing the viral load of an HIV patient, all unverified claims. He has falsely claimed to be "a member of the Upper House of the United Kingdom legislature.” The House of Lords took the step of publishing online a cease and desist letter to Monckton from the Clerk of the Parliaments. He has been spokesperson and candidate for the UKIP party in the UK, renowned for its racist policies. As for being a conservative Catholic he has just launched into a blistering attack on Pope Francis for the contents of the document not yet published. I think the epithet is well earned. It's amazing how climate change deniers suddenly start to define non-infallible papal statements when we have a pope who's challenging old money/fossil fuels. They didn't seem to make the same qualifications when Pope Benedict issued letters to bishops on pastoral care, etc. I thought Andrew Bolt was the only person to use the term "warmist". Pro Life means pro human life as well as the life of the planet. If people want to be in the 2 % who dispute the science, at least see the catastophe happening in Antarctica with the ice shelf diminishing, and the aramageddon-like air pollution levels in cities like Beijing. After 27 years in technical research and production, I have spent the last 17 years, consulting with heavy industry - mining, major engineering, and manufacturing - assisting organisations to reduce their energy usage, the requirement based on climate change science. Most of the company personnel with whom I worked were engineers, chemists and physicists - all of whom accepted the truth of climate change, and sought ways to reduce their company's carbon emissions. There is a very small minority of scientists who do not accept the climate change paradigm, just as there are minorities of geologists who do not accept the paradigm of continental drift and biologists who do not accept the Darwinian paradigm of evolution. In scientific questions, the majority understanding is regarded as correct until proven incorrect. Climate science is correct to the same extent as are continental drift, Darwinian evolution and the heliocentric solar system. It would be better if those who don't accept the economic and political imperatives inferred from climate science, focussed on economics and politics, leaving climate scientists to argue the science. Meanwhile, Pope Francis and Neil Ormerod are qualified to write on questions of "moral and religious legitimacy" arising from the high probability of climate change. The spate of avid neo encyclicalists no doubt utterly support the eco friendly anti artificial contraception Humanae Vitae. Scientific oceanographers report damage caused to ocean life by consistently discarded condoms. And chemicals from the pill in womens urine are causing havoc among fish as sewer water enters waterways to fish life. I eagerly await prof Ormerods renewed assent to eco friendly Humanae Vitae along with total assent to yet unpromulgated Encyclical ":Climatae Vitae"
1. I’ll pass over the highly contentious positions Dr O takes concerning the “racist” UKIP manifesto, the definition of “accomplished”, and the status of Viscount Monckton vis a vis the House of Lords, etc. My point was that, though Lord Monckton may be “eccentric” under certain descriptions, on climate change he’s so well-informed and formidable in debate that no warmist is prepared to take him on. But, lo, his perennial epithet - intended as derogatory - is “eccentric”, rather than some relevant quality that he possesses. As I observed, Dr. Pachauri, who recently resigned as head of the IPCC, is also at least “eccentric” if not “serially sleazy”, given, inter alia, his penchant for authoring pornographic novels on the side. Now even given our rapidly declining moral culture, that’s still not normal behaviour for highly influential world figures. It’s still a tad whacko. But no derogatory epithets are routinely applied to Dr Pachauri. And that’s absolutely as it should be, in my opinion, since such ad hom attacks hamper genuine debate. So, why the difference in treatment here? Consider: Monckton is not of the left. He is not P.C. But Pachauri is. Look up Alinsky and see how the rules apply. (To be fair to Dr O, I haven’t checked out his Pachauri-epithet record. Perhaps he’s the heroic exception for even-handedness.) 2. Dr O’s assertion that Monckton “attacked” the Pope for contents of a document not yet published is demonstrably untrue. Contra Dr O’s selective quotation, Monckton didn’t prophesy that the Pope WILL side with the warmist thesis in his encyclical and censure him on this assumption. As the very article (NCR) referenced by Dr O makes clear, Monckton simply warned that “IF” the Pope sides with a scientific hypothesis of the warmists and thereby implies Catholics are bound to uphold this hypothesis, he will deserve serious criticism. Quite so, and perfectly compatible with traditional Catholicism which has laid down (per, eg Aquinas, Suarez, Cajetan, etc) the conditions under which it is lawful and indeed obligatory to resist Popes and other superiors. Needless to say, were a Pope to insist that the skeptics’ scientific position on global warming was binding on Catholics (imagine that! ), the same criticism would apply with equal force. 3. The one point on which Dr O and I are in furious ecumenical accord is that, bracketing Dr O’s slavish adherence to Alinsky rules in the case of Lord Monckton, there’s much else in his post which I find objectionable. Ian Fraser, how does your comment above re. climate change and evolution theory sit with this comment you made a couple of years back ("Climate Denial Tide Is Turning"Nov 3 2013) ? "Responding to HH, yes it is probable that we do need a few centuries before we can have the same level of certainty about anthropogenic global warming and resultant climate change as we have about the generally spherical shape of the earth and the evolutionary origins of homo sapiens." My problem with applying the word "eccentric" to Monckton is that it gives him a respectability he does not deserve. Eccentrics have been among England's great contributions to civilisation. Think of geniuses like Cavendish who weighed the earth (correctly) and Fitzgerald who "translated" the Rubaiyat more beautifully than the original, each eccentric in the extreme. Or Mr Bean or Monty Python or Spike Milligan; Lewis Carroll and Edward Lear; the Sitwells and the Waughs, all eccentric and wonderful contributors to the caravan of life. Monckton does not belong in such company. If Rerum Novarum was indeed an experiment, i.e. a designed investigation to prove or disprove a particular theory, then it in fact proved nothing but did lend considerable support to one of the most disastrous and unjust "social justice" philosophy impositions on humanity and Christianity the world has ever seen, namely atheistic communism. If Francis' encyclical is indeed also an experiment as suggested let us hope it is properly based and dispassionately weighs all considerations in the debate and tests them appropriately. What a disaster if it were to support a situation which would earn an "honoured place" amidst environmentalists, whatever they are, simiar to that Rerum Novarum has apparently achieved in the union movement according to Prof O. Prof O seems to be aware of the qualifications of many commentators on climate change. I wonder what his qualifications in this area are. Should he possess any, it would greatly help the debate if he could outline for us what were the scientific causes of all the other eras of climate change this planet has experienced throughout its evolution. 'Serial eccentric, Lord Christopher Monckton, verbally attacked the pope, claiming, 'You demean the office that you hold and you demean the church whom it is your sworn duty to protect and defend and advance.' Were I Pope Francis I would wear such criticism as a badge of honour. Climate change skeptics are a diminishing group, headed by desperate people hellbent on propping up the old oil industry or who are so intrenched in their own ideology that they refuse to acknowledge the facts. Yes, facts! I trust the encyclical will sideline prominent skeptics like Maurice Newman, principal economic adviser to the PM and the former Archbishop of Sydney Cardinal Pell. I await the encyclical with hope and a renewed pride in the Church led by Pope Francis. HH suggests some conflict between my comments on Nov 3 2013 - "... yes it is probable that we do need a few centuries before we can have the same level of certainty about anthropogenic global warming and resultant climate change as we have about the generally spherical shape of the earth and the evolutionary origins of homo sapiens" and my earlier comment today: "Climate science is correct to the same extent as are continental drift, Darwinian evolution and the heliocentric solar system." Acknowledging that scientific theories are never proven, only corroborated until disproven, I prefer not to wait for absolute proof before taking action to mitigate negative impacts. My activity in the last 17 years of my working life - encouraging and facilitating reduction of carbon emissions - was standard risk management practice. Risk management is all about taking action BEFORE possible negative impacts, even if we hope those impacts will not occur. Meanwhile HH, I guess I should be honoured that you remember, or at least record, my comments in ES. And for the record, my comment in November 2013 was primarily about risk management: "Responding to HH, yes it is probable that we do need a few centuries before we can have the same level of certainty about anthropogenic global warming and resultant climate change as we have about the generally spherical shape of the earth and the evolutionary origins of homo sapiens. However I do not agree that we should therefore ignore the predictions and statements from IPCC. As a frequent 110kph driver on the Hume freeway, I always leave about 10 car lengths between me and the vehicle in front NOT because I believe that vehicle will stop suddenly but to ensure that I will not collide if it does suddenly stop. If we waited for scientific certainty before taking precautions we would be living in a recklessly perilous world." Why is it, I often wonder sadly, that some people – often anonymously – cannot post a comment without "Argumentum ad hominem", but must sneeringly disparage "opponents" instead of their argument (however strong of weak IT may be]. And, on "First Things" Maureen Mullarkey is just as bad: Dr Ormerod's description of her language as "intemperate" is, itself, very mild: she seems to have a sneering disrespect for everyone whom she disagrees with. To many Australians of my generation "Mullarkey" means "self-interested nonsense"; and that (without having the slightest notion of what might be in the unpublished encyclical) is what she has done in her recent "essay"; and with an implacable intent to denigrate the Pope (something which, I'm sure, she'd have railed against if anyone had written something comparable about John Paul II or Benedict XVI). Both good taste and good will seem to be conspicuously absent from what she writes, and some commenters here seem regrettably afflicted with the same verbal malevolence. I would suggest that everyone who wants to denigrate should divulge an identity. Wow! Scathing stuff, Dr Carmody! I assume Dr Ormerod to be feeling duly chastened, given his textbook deployment of the ad hom to denigrate Lord Monckton. I suspect Dr Carmody may be referring to the tone of some of HH's comments, given that when all argument options are exhausted, he resorts to fear of eternal damnation, fire and brimstone. What I just don`t get in all this emotion and heat, is why my right wing conservative co-confessionals are so incensed about this issue. What makes it part of the "culture-ears", which it obviously has become. I am always rather skeptical myself about "scientific dogma" in case it really means scientific fashion and herd instinct,and as a professional scientist I have seen quote a lot of that. But on the issue of anthropological climate change I have to take the uniform opinion of the world`s principal scientific societies such as the Australia Academy of Science and the Royal Society of London very seriously, and given the likely time scales to potential calamity if they are right, support action now. I agree on that with Ian Fraser; it just seems to me to be common sense. Indeed, at this stage in the game, not to do things to protect the most vulnerable in the world would seem to be sinful. I look forward to His Holiness`s take on this; it is imperative that he speaks about "the greatest moral issue of our day" to paraphrase dear Kevin when in his prime. His Holiness? I just realised what HH stands for. All right, HH, I'll bite. I have no uni qualification in English however your valid remark ("such ad hom attacks hamper genuine debate") which follows your earlier "Monckton disagrees with the lefties’ darling Pope Francis the Great on non-infallible issues." has me confused. 'Leftie's darling' and 'the Great' possibly aren't ad hom but they seem a little tinged to me. It's refreshing to hear the venerable old man of science, Freeman Dyson, blow the whistle on the dogmatic certainty of the warmists. (Eugene, thanks to you I've now read the latest position statements of the AAS and Royal Society, and there's even a surprising degree of modesty there too... so much so that, e.g., your word "calamity" and the like such as "catastrophe" re. scenarios are notably absent.) Anyway, Freeman Dyson: "What I would like to emphasize is that human actions have very large effects on the ecology, which have nothing to do with the climate. Carbon dioxide is what we're producing in big quantities and putting into the atmosphere. This happens to be a very good fertilizer for all kinds of vegetation, good for wildlife, good for agricultural production, so it has many benefits. And this is something you have together with the climate effects, which are much less certain, so it's a question of drawing a balance. I'm just saying I don't understand it and neither does anybody else. I'm skeptical because I don't think the science is at all clear, and unfortunately a lot of the experts really believe they understand it, and maybe have the wrong answer. Of course [the weather] concerns me, but of course, we don't know much about the causes of those things. We don't even know for sure whether it is more variable than it used to be." Another scientist I respect for humility is "Gaia" theorist James Lovelock, who was an outspoken extreme alarmist only a decade ago. Yet Lovelock now says: "The problem is we don't know what the climate is doing. We thought we knew 20 years ago. That led to some alarmist books – mine included – because it looked clear-cut, but it hasn’t happened". Still another is the Guardian's George Monbiot, who rarely for warmists, has the integrity to admit that nuclear power should on the table as a remedy for global warming. Finally there's Bjorn Lomborg, who is a confirmed warmist but applies the precautionary principle with a slightly wider set of parameters than Ian Fraser above, and finds that adaptation is easily the more prudent course. [I.F. : consider in your example that you're not driving alone, but there's a chap next to you having a heart attack and you need to get him to hospital in a matter of minutes lest he die. To drive dangerously to get him there, vs “safely” escorting a mere corpse to the hospital. As Lomborg points out, THAT's the dilemma.] But this was far too much for the faculty of UWA–most of whom, of course, couldn't hold a candle to Lomborg about the issues he discusses–and Lomborg was promptly declared persona non grata, thereby proving yet again the adage that, today, the opposite of diversity is ... university. Dr Ormerod, you really should be careful of the accusations you throw around. The UKIP party in the UK is not renowned for its racist policies, it has a position on immigration, which in today's PC world, leads to the left to invoke racism. I think your country also has a position on immigration.